CLEVELAND, OH--(Marketwire - August 4, 2008) - Online community building and advancing download technology at public libraries were the focus of Digipalooza '08 (www.digipalooza.com). The library download service user-conference, held July 24-27 in Cleveland, welcomed hundreds of librarians and publishers from across the U.S., Mexico, and Canada for a weekend of sharing best practices, education, and networking. Librarians from public, academic, and corporate libraries that offer download eBook, audiobook, music, and video services from OverDrive (www.overdrive.com) shared and celebrated their experiences and innovations. Sari Feldman, director of Cuyahoga County Public Library and president-elect of the Public Library Association, presented the conference keynote address and encouraged libraries to embrace digital media and become active participants in online communities. Digital Pioneer Awards, or "Digies," were awarded to leading libraries demonstrating excellence in the expansion and promotion of their digital download websites. outreach programs for their download catalog. experiences for download audiobooks and media. including record-setting growth for circulating digital book titles. community outreach, and collection development practices. large number of independent libraries sharing a digital media catalog. distributing locally produced student films. excellence, resulting in record circulation growth. member libraries including contests and MP3 raffles. Digipalooza '08 was sponsored by leading audiobook, eBook, video, media, and technology companies including BBC Audiobooks America, Books on Tape, Brilliance Audio, HarperCollins Publishers, Blackstone Audio, Creative, Harlequin, Image Entertainment, John Wiley & Sons, Library Journal, and Random House. Hundreds of Digipalooza 2008 attendees were also the first to tour the Digital Bookmobile. The 74-foot, high-tech community outreach vehicle launches its national tour on August 10, 2008 in New York City at an event in Central Park in association with New York Public Library. "Digipalooza '08 provided a forum for librarians, publishers, and technologists to discuss advances, promotional opportunities, and best practices for library 'Virtual Branch' download websites," said Shannon Mangan, library partner services manager for OverDrive. "As a library user conference, we have brought together the leading innovators that provide 24/7 access to popular digital books and more." OverDrive powers popular download media catalogs offering eBooks, audiobooks, music, and video at thousands of libraries, including institutions in New York City, Singapore, Boston, and Toronto. To see if your public library is a member of the OverDrive network, visit http://search.overdrive.com. 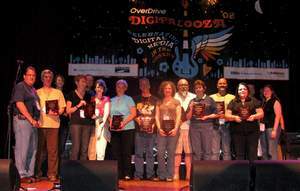 Digital Pioneer Awards, also known, as the 'Digies,' were awarded to 13 libraries/consortia on stage at Cleveland's House of Blues.